A bus company whose vehicle was involved in a collision that killed five people has been fined after it was found the vehicle had faulty brakes. 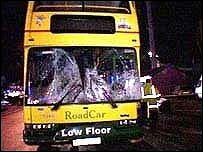 The bus struck a group of pedestrians outside the Fantasy Island resort, Ingoldmells, Lincs, on 11 April 2004. Skegness magistrates found Lincolnshire RoadCar guilty of breaching safety provisions and fined the firm £2,000. The court heard that the brake problem would have had only a minor effect and was not related to the collision. John Mitchell, prosecuting, said the brake fault was found by police investigating the road deaths but had not caused the seafront crash. He said: "This allegation has nothing to do with the tragic incident. "As a result of a detailed examination the defects which are alleged were discovered." The bus was serviced just two days before the crash, when a fitter spotted and remedied three faults with the brakes system - but not the problem with the slack-adjuster on the brakes. Lincolnshire RoadCar denied an offence of using a motor vehicle with defective brakes. The driver of the bus, Stephen Topasna, is separately accused of five charges of causing death by dangerous driving and one of driving without due care and attention. He is due before Lincoln Crown Court later this month.